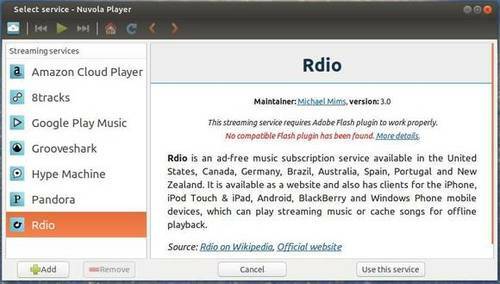 This tutorial shows how to install the Nuvola Cloud Music Player on Ubuntu 13.04, 12.10, 12.04 and Linux Mint 15, 14, 13 via PPA repository. Nuvola Player is a free and open-source cloud music integration for your Linux desktop, it runs a web interface of cloud music services in its own window. Currently supported services are Google Music, Grooveshark, Hype Machine and 8tracks, Amazon Cloud Player, Pandora, and Rdio.